Can you believe it's that time already? My oldest goes back after Labor Day weekend and I know he's excited!! 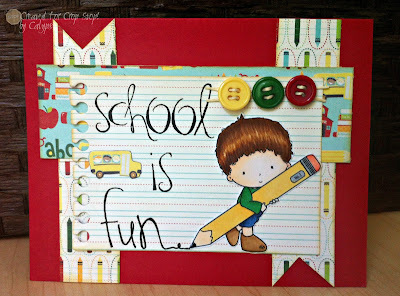 So adorable, love this school card, fab image,great colours!! Thanks for joining us at Lexi's Creations for our 'back to school' challenge! this is so adorable and I love how you used this sketch, thanks for playing with us over at Loves Rubberstamps!!! What a sweet card! Love the paper! Thanks for playing along with us at My Sheri Crafts! Ahhh, this is beautiful and I just love the image, perfect. Thank you for joining us at Lexi's Creations. This is the CUTEST! I love the new Bauregard stamp :) You did a great job coloring him and that sentiment is AWESOME! Thank you so much for joining us at Loves Rubberstamps this week! What a cute card! Great card! Thanks for joining us at My Sheri Crafts! Elegant card and a good approach towards excellence! i think you just made it perfect keep it up.